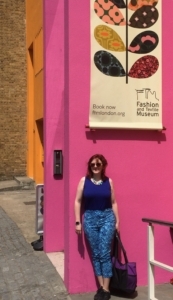 The last time I visited London, I found this wonderful little gem of a museum in the Southwark neighborhood. 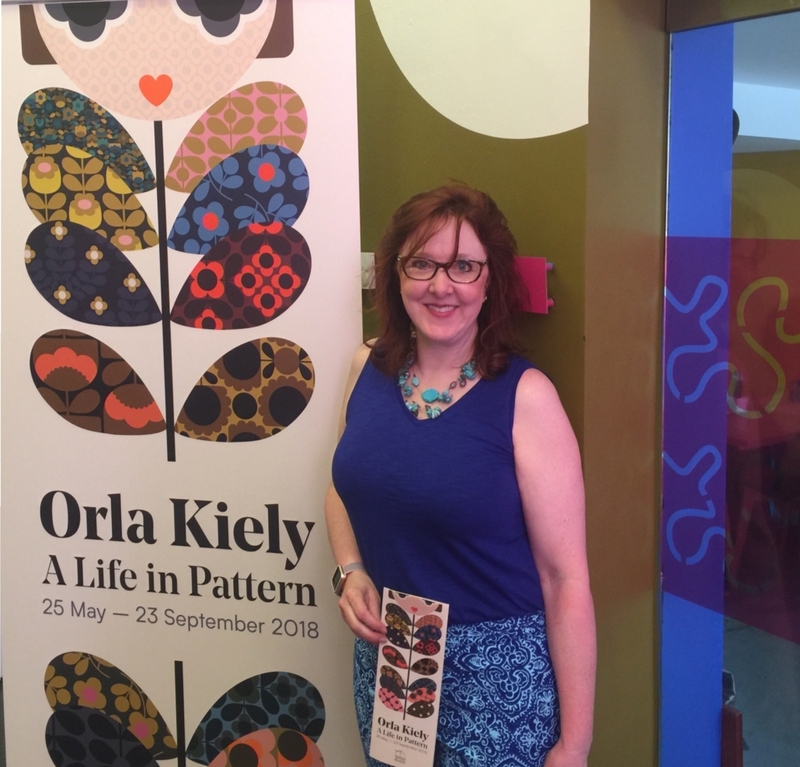 This visit, they are featuring the work of Orla Kiely, one of Ireland and the UK’s most famous fashion designers, a perfect blend after just completing my trip to Ireland! 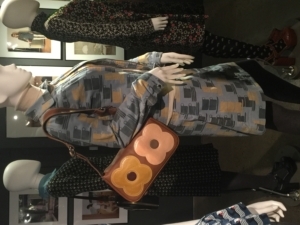 Orla Kiely studied textile design in Dublin in the early 1980’s and received her MA from the Royal College of Art in 1992. 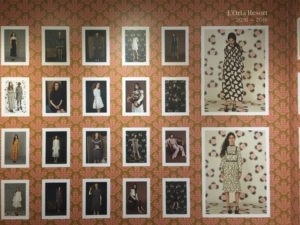 Having grown up in Ireland in the 60’s and 70’s, Orla’s design are influenced by the styles, colors and patterns of that era. Nature inspires many of Kiely’s repeating patterns. 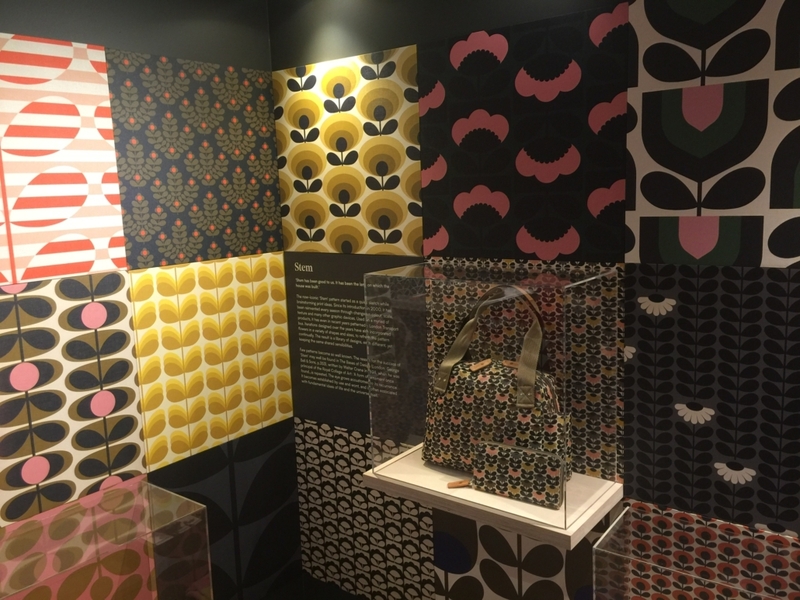 Her “Stem” pattern has become an iconic design, catapulting Kiely into International design success in 2000. 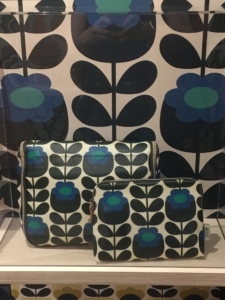 Display of different iterations of Orla Kiely’s Stem pattern. 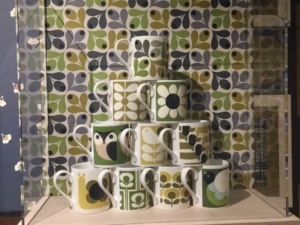 Coffee mug collection featuring Orla’s designs. 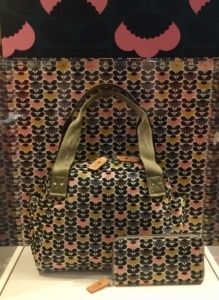 Her designs are based in rhythmic and repetitive pattern, now popular in accessories, handbags, wallpaper, and home decor, as well as her seasonal fashion collections. 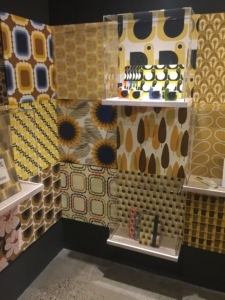 Changes of scale, coordinating colors (often in a 1970’s palette, including avocado green, harvest gold, orange and chocolate brown), and whimsical, near-abstract depictions of animals are all common elements that make Orla’s designs unique and distinguishable. 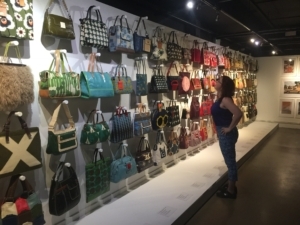 The exhibition includes over 150 patterns and products and is well worth attending! 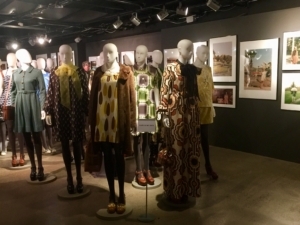 Filmed videos of Orla describing her inspirations, creative process, and collections, as well as footage of her fashion collection engage the audience in a multi media experience. 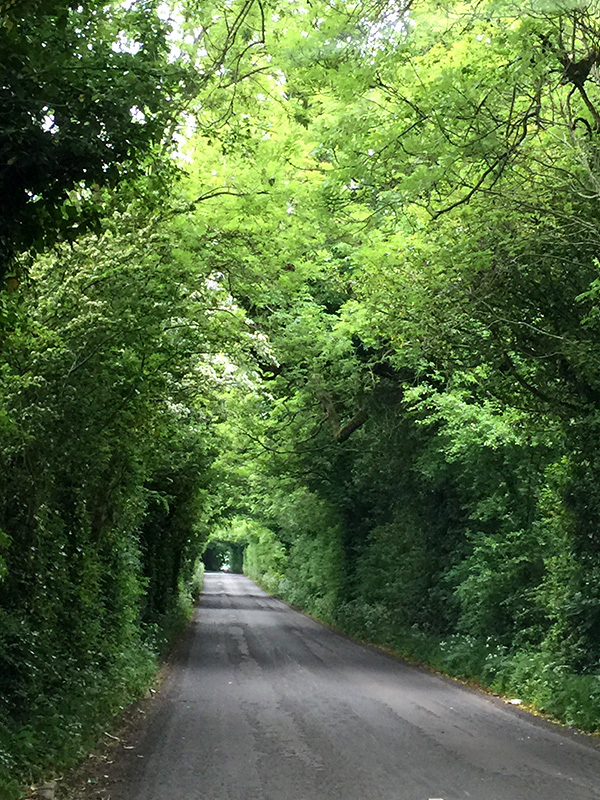 About a month before my trip to Ireland, I get a text from my friend Pam Olney ( @quiltersgarden ) who was currently IN Ireland. She told me I had to add Avoca Handweavers as a stop on my trip. I love getting recommendations from my fiber art friends! 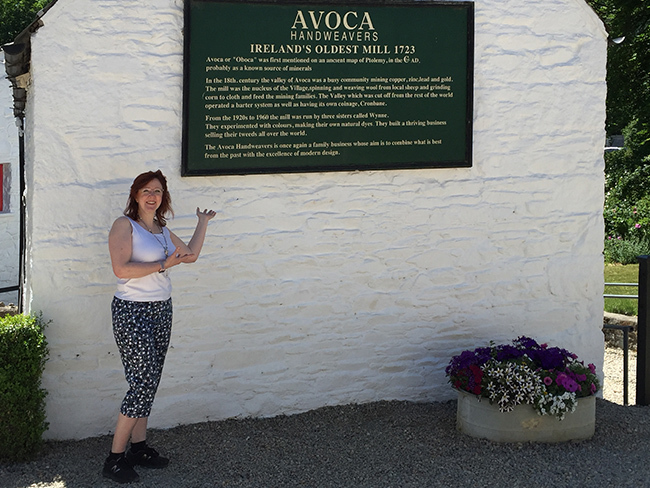 Established in 1723, Avoca is the oldest mill in Ireland still in production. 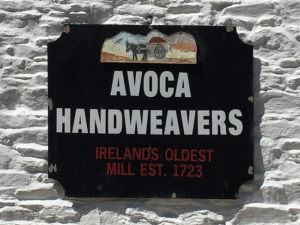 Although it has gone through it’s ups and downs, Avoca Handweavers is now a thriving International business, employing over 800 people. 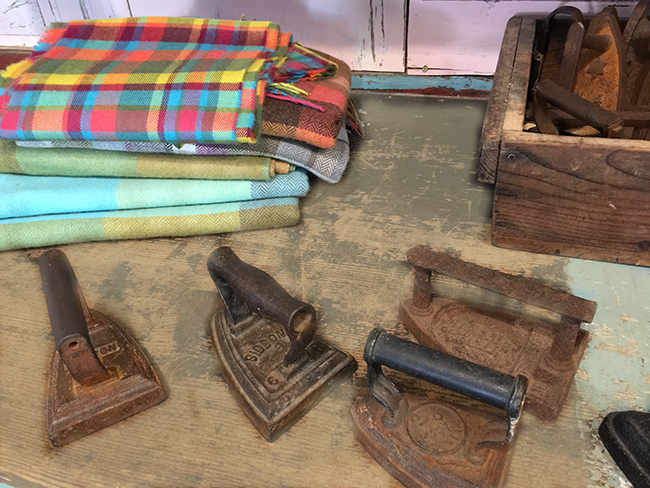 While there are 10 Avoca retail locations around Ireland, the Avoca village location allows you to tour the old mill, the current weaving production facility, as well as having both a wonderful café and giftshop. 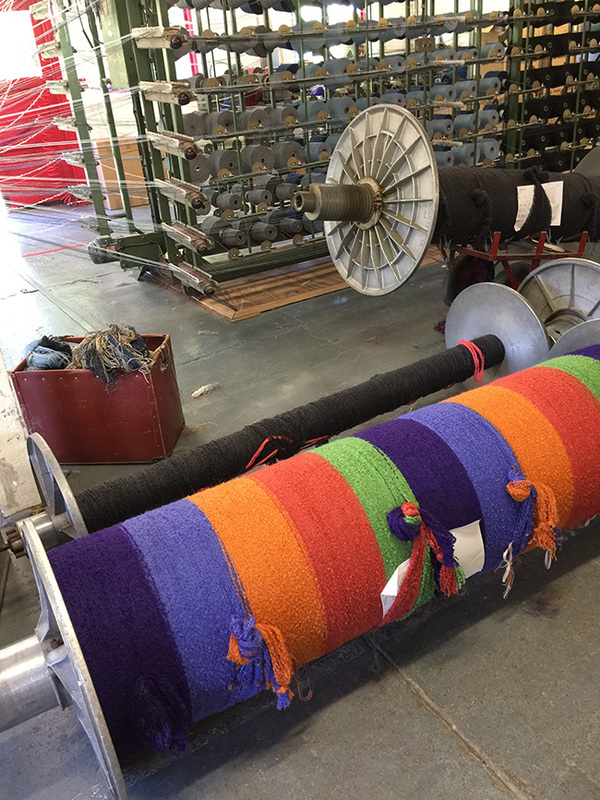 In background, the threads are fed in the correct sequence onto the “Swift” and then onto a “Beam”, like a giant spool for warping the loom. 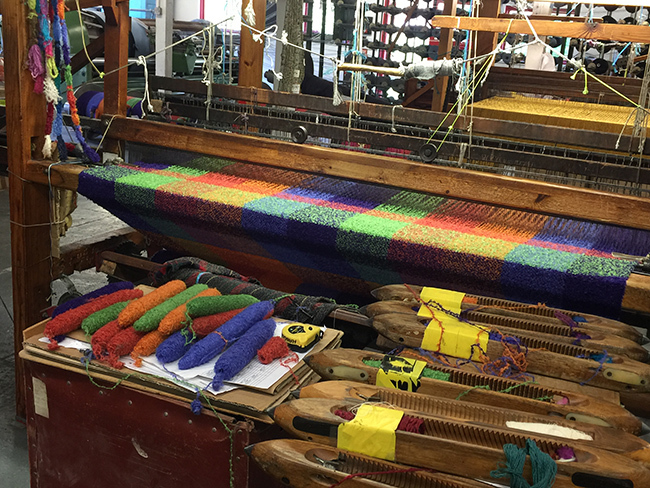 The beam is then lifted onto the loom to be “tied in.” It can take up to 2 days to complete the setting up of a warp. The mill displays old weaving equipment, educational displays, explanations of the different processes, as well as modern equipment in use. My guilty pleasure… Game of Thrones (well, Fantasy & Science Fiction overall.) Now, mix that with textile art and I’m in heaven! 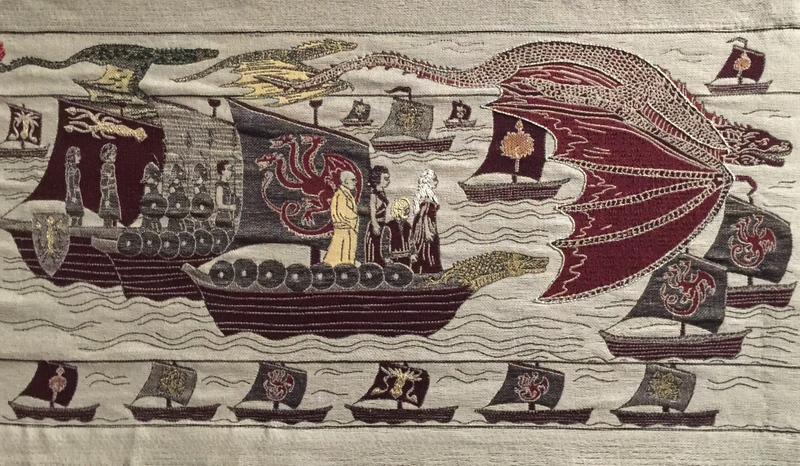 Before the final episodes of Game of Thrones were filmed, an army of designers, weavers and embroiderers in Northern Ireland was hard at work. The tapestry was designed by hand by illustrators and color artists Carim Nahaboo, Jacob Merrick-Wolf, and Rob House. 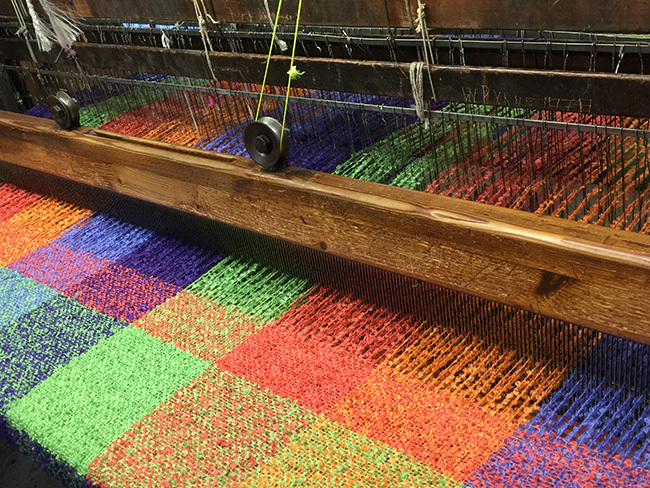 The weavers, Juliet Bailey, Franki Brewer, and a team at Dash & Miller in Bristol used a state-of-the-art jacquard loom. 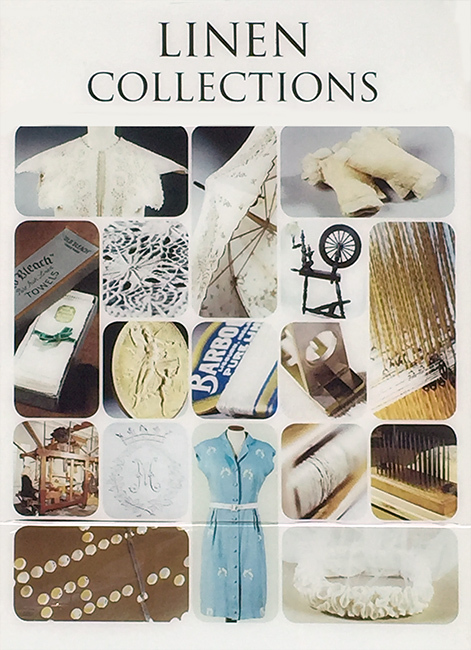 The linen thread was provided by Thomas Ferguson Irish Linen in Banbridge, one of the last surviving mills in Northern Ireland, and contains over 250,000 threads placed by hand. 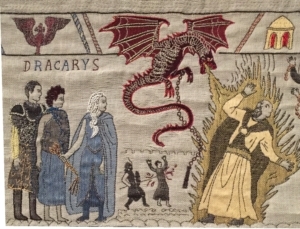 Each episode through season 7 is represented in the 253 foot tapestry. Rather than wait for the final season to be released (Season 8, set to air in 2019), the tapestry develops its own conclusion. 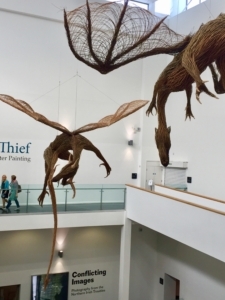 After the weaving was complete, delicate hand embroidery added by a team of 30 stitchers at the Ulster Museum adds color, glints of metalics, and detailing to enhance the tapestry. From King Joffrey’s golden crown to Daenerys’ shimmering white and silver hair, blood red weddings, emerald green wildfire, cold-blue White Walkers and jet black ravens, threads of metallic, cotton and silk yarns bring vibrancy and lustre to the story. The embroidered elements are quite simple overall, but bring much to the finished project. Stitches include chain stitch, split stitch, back stitch, running stitch, couching and seed stitch. Click on the video below to view the entire tapestry! A woman & young girl embroidering linens in County Down early 1900’s. 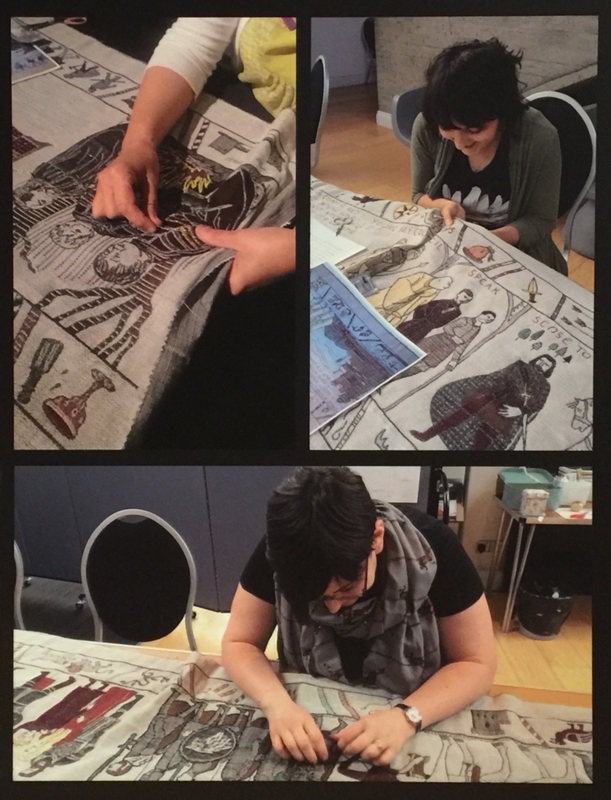 As well as information about the making of the tapestry, the exhibition included further documentation on the history of the linen industry in Northern Ireland, supplementing what I’d learned in Lisburn. As a member of one of my favorite organizations, the Contemporary Quilt Art Association, I’m hoping to enter an exhibition next year called “Natural Geometry”. Boy, do I have inspiration to tackle that theme! 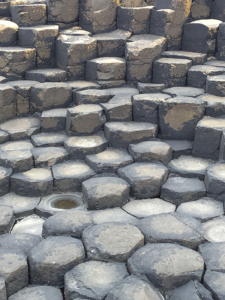 A World Heritage site, the Giant’s Causeway is comprised of polygonal basalt blocks, most frequently 6-sided but some have 4, 5, 7, or 10 sides. The legend behind the name of this geological wonder goes as follows. The giant from Ireland, Fionn mac Cumhaill (aka Finn McCool) is being threatened by the Scottish giant Benandonner across the sea. 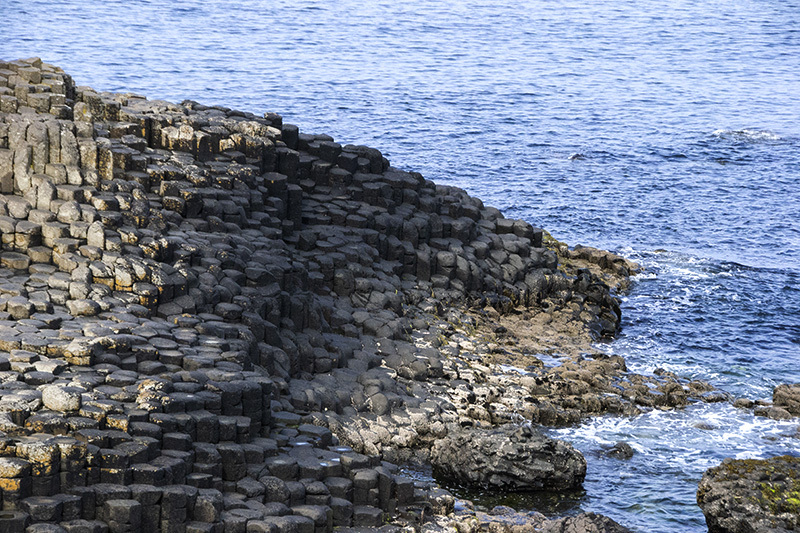 Finn grabs up huge rock pieces from the coastline and throws them into the sea, to make a pathway for Finn to go across. However, when he gets across, he realizes that Benandonner is terrifyingly massive! Finn rushes back home to Ireland where his wife disguises him as a baby. When the Scottish giant comes to their door and sees McCool as a baby, he thinks the father must be much larger than he is, so he races back across the rock bridge to Scotland, causing most of the bridge to sink! One of the things that surprised and delighted me was the gift shop and interpretative center. Rather than just have the typical tourist doodads, they had a wide variety of quality artwork from local artisans, fiber art included! 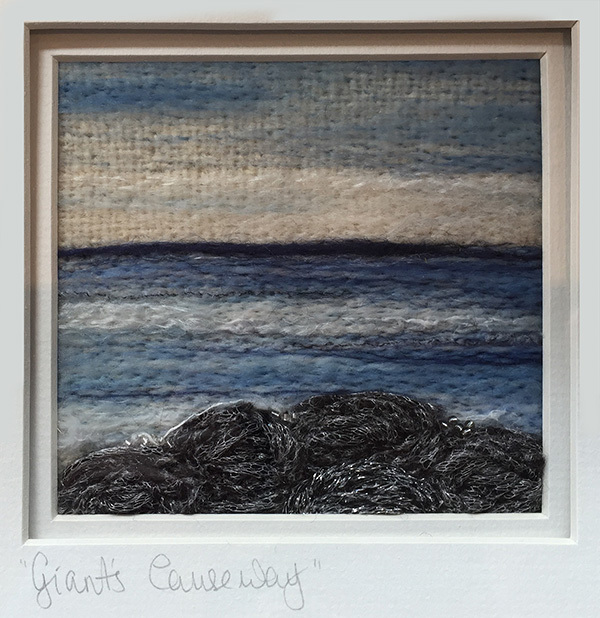 Breda McNelis is one of the textile artists that are represented by the shop. 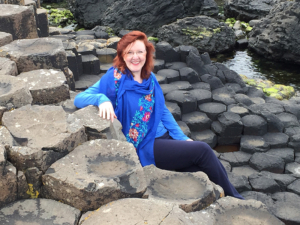 Her work is inspired by the colors and textures of the Irish landscape. 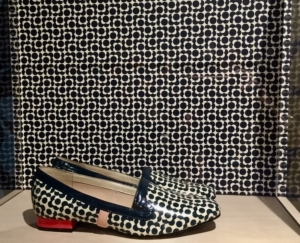 She also works with traditional Irish fabrics- Báinín, a traditional Irish fabric which is an un-dyed, woven 100% natural wool and colorful Donegal tweeds. 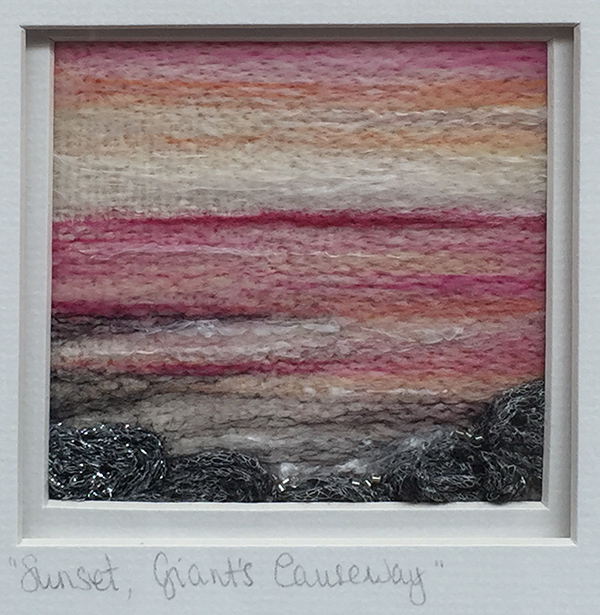 Her pieces are layered with silk fibers, hand-painted silks, merino wool, and beautiful yarns. 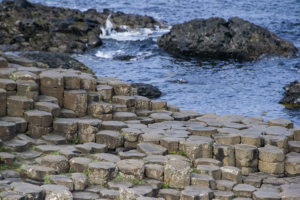 The mystery and magic of the Causeway Coastal area at the North-western edge of Ireland has drawn tourists for 400 years, but most recently has gained greater fame from the Game of Thrones series. 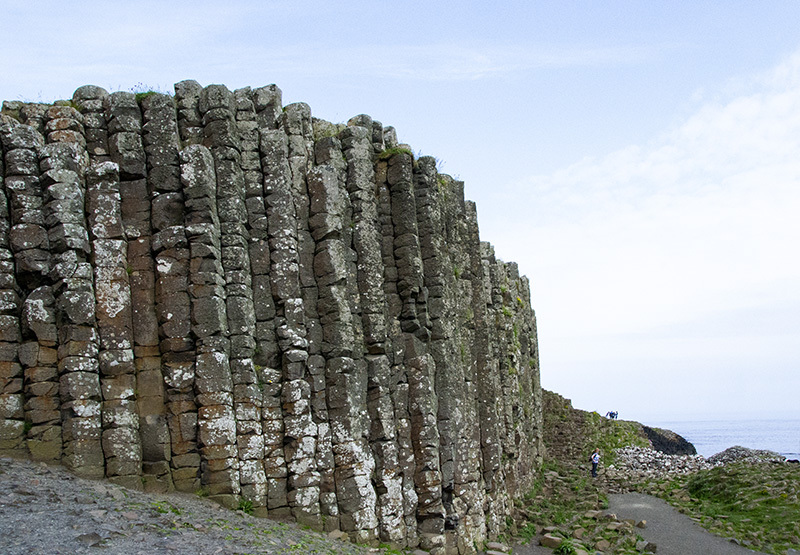 With the abundance of medieval buildings, beautiful landscapes, and mysterious caves, Northern Ireland became a natural location for filming this fantasy mega-hit. 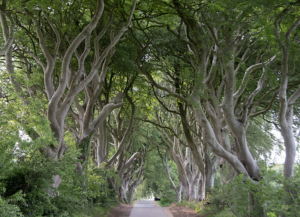 One of the locations, “The Dark Hedges”, was used as the Kingsroad for the people of Westeros and was shown in Season 2, Episode 1 when Arya Stark escaped King’s Landing in the back of a cart. 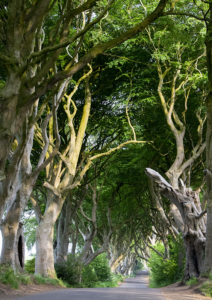 Planted in the 18th century, the intertwining beech trees create a spooky, other-worldly setting. In 2016, storm Gertrude hit Northern Ireland with 130 km/hr winds, causing a number of the trees to fall. But the creative genius of the people of this area took this tragedy and made something beautiful out of it. 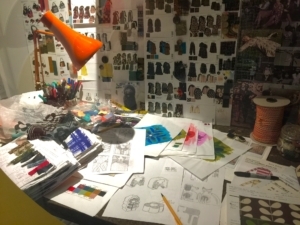 The huge trunks were removed and a group of designers and craftsmen interpreted different scenes from the Game of Thrones Session 6 into a series of 10 incredibly carved doors. Each of the doors were then installed at a pub at a Game of Thrones film location in Northern Ireland. Click here to see a short film on the making of the Doors of Thrones. 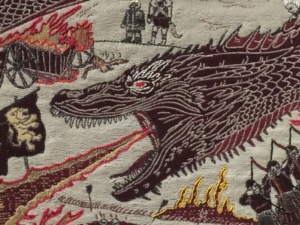 Coming soon: Blog on the “Game of Thrones Tapestry”! As many of you know, I have a wee bit ‘o Irish in my heritage. My paternal great-grandfather, Robert Fairley, emigrated from Lisburn in Northern Ireland around the turn of the century. 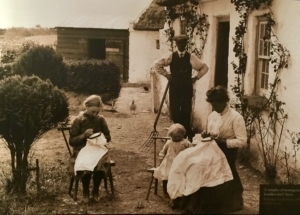 I also have two g-g-grandparents from Ireland from different sides of my family tree. So between my familial name, red-headed genes from my Dad, and family lore, being Irish was the strongest ethnic identity stressed in my childhood. So I was very pleased to have found some possible distant cousins living outside of Lisburn prior to our trip! Unfortunately, many records in Ireland were destroyed in the Irish Civil War during a bombardment and resulting fire that ravaged the building in Dublin which housed Public Records, so we haven’t yet been able to trace the exact relationship. But, considering how few Fairley’s lived in the area, it’s quite likely we have ties a few generations back. We stopped in to meet these cousins in person and then went together to lunch and the Irish Linen Centre and Lisburn Museum. 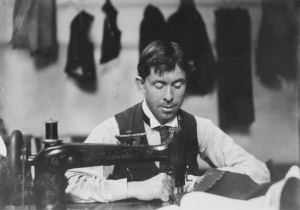 Robert McKee Fairley, my great-grandfather, at his tailoring shop in Salinas CA, c 1900. The Museum’s researcher, Ciaran Toal, had kindly answered my inquiries about my family and met with me when we were there. 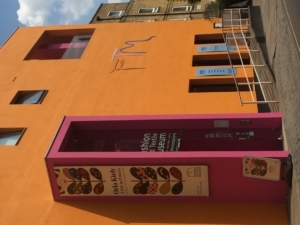 The top floor of the museum is dedicated to their “Flax to Fabric – the Story of Irish Linen” exhibition. 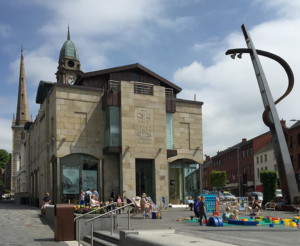 If you get a chance to go to Lisburn, a visit here is a must! It starts with through the whole process of growing flax; hand harvesting & tying into parcels called”beets”; soaking the beets in water to soften the stems (a very pungent process); drying out the beets; and “Scrunching” by beating the flax stems with wooden clubs and then separating flax fibres from the unwanted woody parts of the stems. They have wonderful old photos of the each step of the process, as well as equipment used and samples. 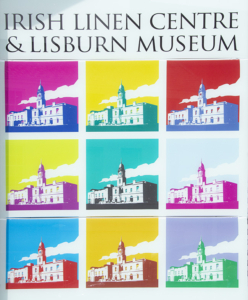 After the flax production, the history of linen in the Lisburn area is displayed in depth, starting in 1698 when King William III appointed an Overseer of the Royal Linen Manufacture in Ireland and a weaving premises was set up in Lisburn. In the late 17th C, many immigrants from Northern England and Southern Scotland came to the Ulster region, probably including my Fairley ancestors. The spinning of the flax into linen yarn or thread was mechanized in the 1820s, giving a fine quality yarn which was more reliable for weavers than hand-spun. When the linen cloth was taken from the loom, it was the original brown colour of the yarn. This was sold in “brown linen” markets. The process of bleaching brown linen yarn was complex and could last up to six months, but created a finer product. To create a lovely sheen on white linen, the bleached cloth went through a final process known as beetling, involving beating the cloth with mallets to close up the weave and achieve a dense, lustrous finish. 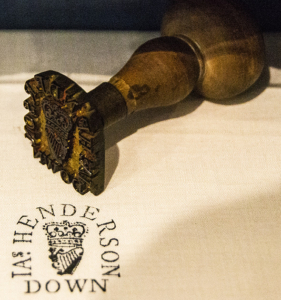 Both brown and white linens had quality inspection processes where they had a seal used to verify the quality. The stitching of the cloth, whether into garments or as embroidered embellishments, was the final step of the long process. While I’m not able to share any photos per agreement with the museum, I can tell you the needlework is nothing short of extraordinary! Veils of soft, semi-transparent linen gauze with incredibly fine perfect stitching; cutwork and drawn-thread work; Irish crochet lace; and much more. 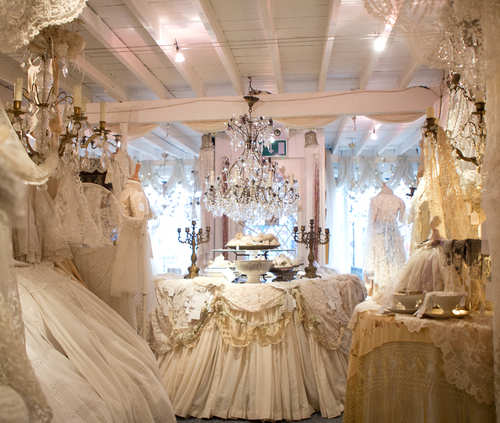 Some of the height of the collection includes pieces made for Queen Victoria, including a Golden Jubilee damask table doily from 1887 which was part of a set of 24 damask doilies depicting the new Royal Irish Linen Warehouse and a set of different miniature household items made for Queen Mary’s dollhouse! 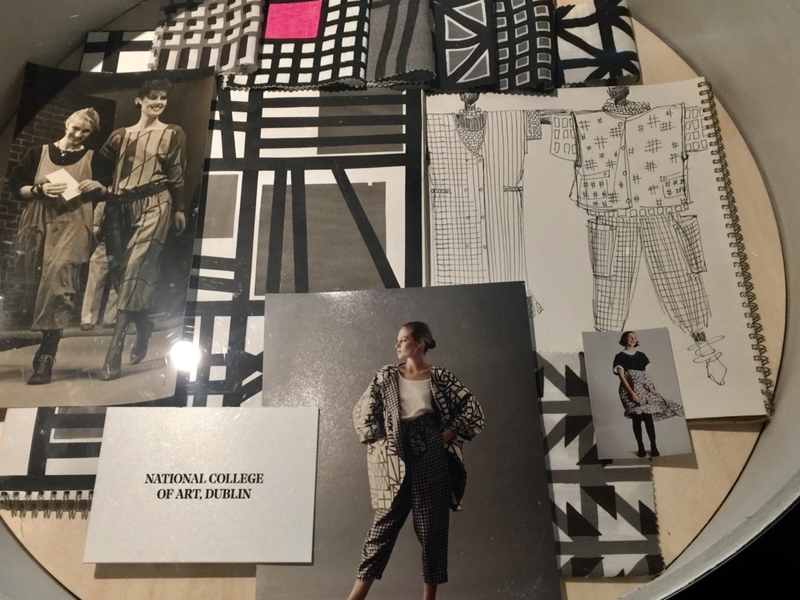 There was also information about Irish designer Sybil Connolly (1921-1998), who took inspiration from traditional Irish clothes and fabrics. Her clients included the Rockefellers, Mellons, Elizabeth Taylor, and Jacqueline Kennedy. I could go on and on, but suspect I’ve probably written more than most would care to read. It was with some regret that I said good-bye to my newfound friends/cousins and to Lisburn. But, I suspect that I’ll be back sometime in the future!